With demand for collaboration solutions increasing, organizations that were early adopters can teach late adopters some valuable lessons regarding their experiences, both good and bad. Over the past ten years the industry has witnessed an increased demand for Information Worker solutions due to an increased mobilized workforce and traditional IT simplification projects. Generally, for Information Worker solutions to be successful, a multi-faceted approach (Governance, tools, people etc…) are required. From a Microsoft perspective, the core of collaboration for Microsoft is SharePoint technologies (Including Skype, Exchange, One Drive etc.). For IBM it was Domino but is transitioning to Web Sphere based solutions. In this Blog I will share some of my experiences working with clients since 2004, identify pitfalls and recommend an approach to use with clients once they have made the decision to adopt Information Worker tools. Note I developed this model in 2005. SharePoint – Presence for collaboration, application integration and delivery, document management, workflow, search and social networking to name a few. Skype – Presence awareness, Instant messaging and video conferencing. Exchange – Messaging, calendaring and contact information as well as SMTP engine for SharePoint. Office 365 – The suite of applications. Mobile devices – Laptop, tablet, phone etc. As with any tools, they are only as successful as the organizations ability to adopt them. Specifically, a change management program that introduces policy, training, mentoring and adoption measurement must also be in place – Search on my “user Adoption Framework” Blog for more information. A major component of collaboration is the culture, are people incented to share? Management endorses and nurtures the culture? Without these key cultural and behavioral items in place collaboration won’t happen. An executive funded and HR driven program is generally required with incentives, measures and adoption program. Note this is one of the toughest areas for some companies (especially old cultures) to address. Management in such companies is accustom to measuring performance by being in the office and at your desk – not productivity and meeting clearly defined objectives. For office design the old style cubed and siloed office designs are replaced by an open concept for desk sharing, pods for teams to work, meeting rooms with AV enabled boards, phones etc. that enable people and teams to communicate no matter their locations. An office design company can assist with this area of concern but use caution as open areas can become unusable due to noise and crowding. Stage One – Establish/Ready the foundational IT services, technologies and operations. This technology includes authentication technologies such as AD, security such as VPNs and virus protection, server consolidation/optimization and storage and consolidation/optimization. Provide the basic devices and access to the corporate network. Also, user adoption plan developed to influence culture and measure adoption is developed. 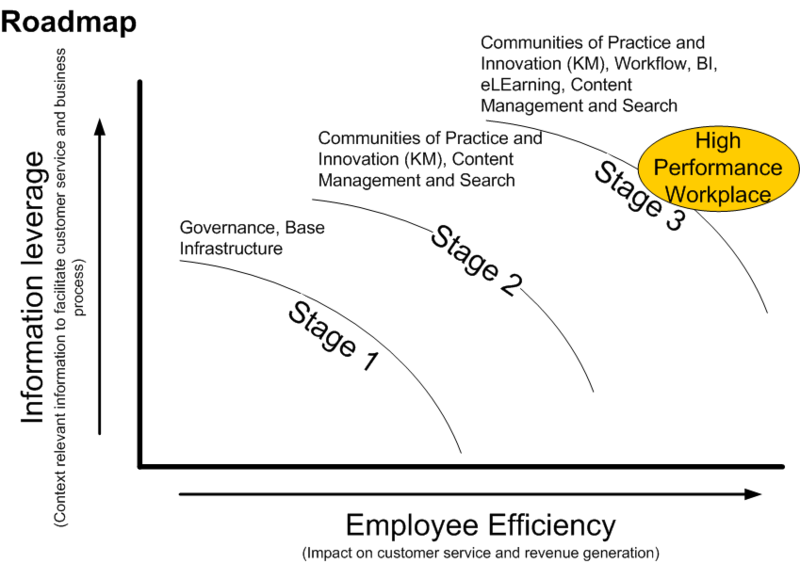 Stage Two – Establish collaboration environments and develop rich information architectures that support communities (practice, professions, interest) and optimize them for efficient search and browsing. The access to the systems is optimized for mobile workers whereby anytime anywhere access is provided through laptops and smart phones as best makes sense. User adoption plan executed to influence culture and measure adoption is developed. Stage Three – consolidate, integrate, leverage and retire duplicates from your application portfolio. Develop rich composite applications that leverage corporate data sources, documentation and workflows. Develop business focused social networks to truly leverage the organizations IP (products, services, knowledge, contacts etc…). Also, ongoing user adoption execution and measurement ongoing until target adoption levels reached. IT – several foundational technologies are required such as networking (internal and external), security, authentication, servers, storage, management and operations. Additionally, staffing for these technologies is required in order to provide help desk and other forms of support. Finally, service arrangements with outsourcing and leasing companies have an impact. Business – the staff and management are busy supporting clients and their business partners. Generally bound by policy and procedures (Company and regulatory to name a few…), they have day-to-day objectives and tasks to carry out. Remembering that people generally resist change (and like routines that don’t change) introducing new technology is viewed as disruptive (unless it’s fixing something that is terribly wrong). Attempt 1 – Consolidate Collaboration applications (Intranets, Portals, collaboration tools etc…). They move from 4-5 tools down to 1 or 2 and dump their data into the tools with little rigor applied. Operationalizing the tools generally means just opening the door and letting the tools sink or swim. It is focused on IT plumbing and not information and people. Culture isn’t ready, management micromanages and doesn’t support, staff don’t participate because management doesn’t support or provide direction. Adoption is usually 5-10% of planned audience. Attempt 2 – The sink or swim approach which generally leads to sinking. The tools becomes bloated with useless data, there are performance issues because of service capacity, navigation becomes difficult and search returns hundreds if not thousands of pages filled with useless data. Why? No user adoption plan, content strategy, information architecture, content management disciplines and governance of the service offering. Adoption decreases due to frustration, IT looks foolish. Attempt 3 – The realization that a mix of governance, content strategy, information architecture, process, policy and staffing is required for the service to be sustainable with any level of quality. Objectives are revisited, planning done accordingly and correctly, funding is allocated and a properly staffed team assembled – experience people and executive support from business, IT and service providers. So why do things go wrong? Generally, organizations begin with a vision that is well intentioned but later degrades to let’s just get something done to meet the dates enforced on us my senior management. Also, much of Collaboration adoption is not well known as compared with Email (such as Exchange), which has been around for decades in some form or another. Exchange patterns and practices for requirements, design, deployment and operating are well known. Governance – a companies lack of appreciation or understanding of governance and maintaining the environment / sustaining the culture” – e.g. this is where training for end-users / administrators and Information Managers is required, how to operationally implement content management or collaboration based policies and standards. Basically Collaboration culture does not happen on its own – governance that is implemented and controlled nurtures it. Unrealistic dates – usually set by a new executive trying to make their mark or external factors that force dates (such as compliance). Unrealistic expectations – a vender oversells their product and or the solution marketing campaign within the organization was hastily assembled and delivered. Too many projects on the go – the average large organization has thousands of projects on the go at any given time. Understanding the collision points and dependencies is usually the challenge. Too many new technologies – new technologies are not well understood and their quirks/bugs are unknown. These sorts of unknowns can add weeks and or months to a project. Staffing and skill set shortages – with so many organizations running leaner these days, it’s difficult for them to juggle skills and ramp up for new technologies and or contracts when demand is high. Work all day and learn all night might be a good analogy! Establish governance – this consists of executives, department management, department SME, PMO, Architect team and purchasing. Staff your team with experienced consultants – knowledge transfer is key to your staff and leveraging experience is key to reducing risks. Assign (dedicate a %) your staff to the project team – your staff won’t learn nor accept ownership unless they are involved. Understand your organization’s information management needs – many compliance officers are concerned that Collaboration solutions will complicate records management enforcement. Design a service model for Collaboration – approach Collaboration as a service offering and adopt a service level approach to developing your architecture. Content and Systems Strategy – in order to drive user adoption the user experience (and cost savings) must be compelling. Information Architecture – in order to build and sustain a usable and intuitive environment, the layout of the sites, pages and content must aggressively managed (governed) using content mgmt. disciplines and security as best makes sense. Collaboration architecture – the architecture for your IW solution whether it stands alone or is integrated with existing or new systems. Systems Architecture/Impact analysis for the infrastructure that will support the Collaboration solution. Realistic project charter and schedule – a project charter, schedule and staffing, amongst other PMI recommended process and artifacts. Tailoring this approach is key to success since many organizations will have completed work in some of the areas. Expect gaps but don’t force them to reinvent the wheel. With the upward trend of Collaboration solution demand, we have an incredible opportunity to provide solutions based on Microsoft technologies and third-party solutions that bolster the solutions functionality, performance and manageability. The challenge? Lack of funding, priority, skill sets and quality execution – organization dogma and lets face it SharePoint is generally a tier 3 service (not critical to business). I’d like to hear from you regarding your thoughts on this Blog and ideas you have to improve the approach!